fiction | English, ESL -- and more! On this site this post on Wuthering Heights gives some ideas on genre and background. There is heaps on The Victorian Web. See also this City University of New York site – it includes a chapter by chapter analysis. Do you have doubts about Mr Rochester? See this insightful and amusing hating Rochester post: A Monster is Born by Moira Briggs. …When she finally accepted that no-one was going to touch The Professor with the proverbial barge pole, Charlotte tried again. This time she resurrected her favourite character from her Angrian stories – the arrogant, brutally handsome (yawn, yawn) Zamorna – and cross-fertilized him with her idealized mental portrait of Constantin Heger. In the process, she created a monster. She created Edward Fairfax Rochester. Some students shine at analytical or argumentative writing but run a mile from “creative writing”. Since creative writing is now mandatory in Paper 1 of the HSC for Advanced and Standard English, such students need to work on this area. Steven, my 2006 coachee who attained Band 6 this year, was such a student. I am sure practice in this area helped him. See also the “Writing” tag in the side bar, and check the writing archive on John Baker’s blog. John is an English crime fiction writer. There are also many good books: for example, The Writing Book by Australian writer Kate Grenville. Short Story Tips from the Short Story Group. You might like to check the rest of their site too. Literature: What Makes a Good Story — Join our journey through a classic short story, “A Jury of Her Peers,” by Susan Glaspell. Along the way, you’ll solve the mystery of whether Minnie Wright killed her husband and explore the story’s literary elements. You will also encounter rest stops where you can read more about the structure of story and take part in activities related to “A Jury of Her Peers”. Tips for Writing a Short Story by Jennifer Stewart. Writing short stories that work. Writing a short story that works involves learning how to construct a foundational framework by use and development of plot, theme, characters, denouement and conclusion. Writing, Blogging & Creative Travel Photo Prompts. Quality varies, but such exercises may lead somewhere. He’s clearly successful, but how good is he? 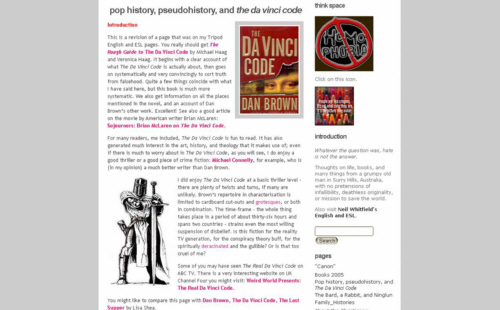 One of the most popular pages on the old Tripod site was my rant about Dan Brown’s The Da Vinci Code. 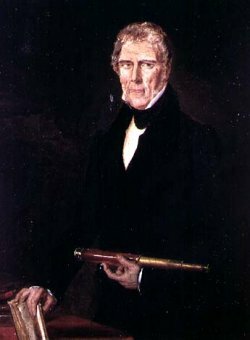 It has reappeared on my personal blog as Pop history, pseudohistory, and The Da Vinci Code. Thoroughly revised. Now what do I know about Malouf and Wordsworth…? In 2005 I had two students who were reading David Malouf — Answers.com or Wikipedia are both good places to start looking. One student was studying An Imaginary Life in the context of an “In the Wild” module also featuring Wordsworth. (He got Band 6 in the end.) Nature in Answers.com is worth a visit. 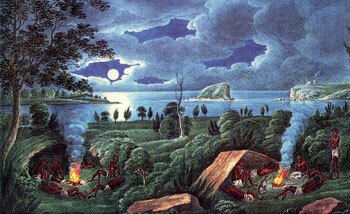 So of course is Wordsworth The other was studying The Great World as part of a Year 11 unit on “Visions of Australia”. Here is a site that fits Malouf into a postcolonial context. Could be useful. This Introduction to The Great World is concise but a reasonable start. This is one of the best things I have found so far for both books. Film Australia (PDF) has published these “viewing notes” for a documentary on Malouf also called An Imaginary Life. If you want a rather turgid essay in pomo style on An Imaginary Life, look at “An Imaginary Life by David Malouf: The Struggle for the Sign, the Struggle for the Self”. Look too at “The Stranger in Three Novels by David Malouf” by Jorg Heinke, University of Kiel, Germany — even if it is oddly organised — or at least I think so. Comments Off on Now what do I know about Malouf and Wordsworth…?